Ensure the wing is plenty deep enough for a standard servo, and the spoiler required is just the “door” type which is supposed to open to about eighty degrees. As for the spoiler itself, it seems to me that the most efficacious approach would be to build both the spoiler and its aperture as a complete unit first, and then insert it into the wing. This will allow you get the thing hinged and working properly and hopefully render the final fitting process quite simple. First you need to make up the aperture box from perhaps some medium 1/4″ balsa sheet, this need only be a simple frame. 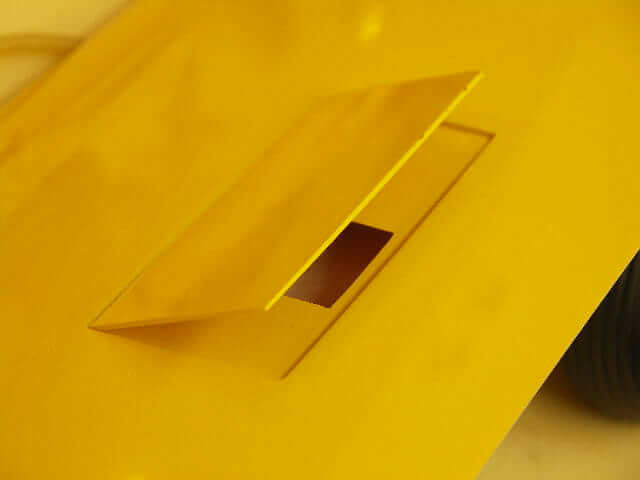 The trickier bit involves making up the spoiler blade itself and getting it to rotate through as much of a 90″angle as possible, without the leading edge fouling against the front of the aperture. Over the years, I have tried several different methods of achieving this objective, although never copying the full-size approach of using a full-length piano hinge. (I could never find a hinge long enough. The best results so far were achieved with the spoilers on the Schweizer 2-32, so I will go into a little detail for anyone who may be interested. Using a couple of flat hinges, the two things to be considered are the building of suitable slots into the blade, to allow the hinges to be easily inserted – and setting the hinge line in such a way as to allow maximum movement. 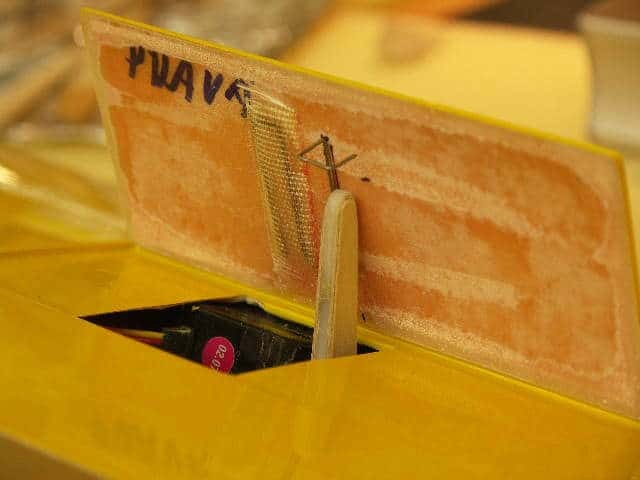 I used to make the blades up from balsa laminated with ply, the balsa face on top, so that it could be sanded nice and flush with the wing. However, when you think how a bi-metallic strip works, such as the one that switches off your domestic kettle (as the water heats up, the two differing types of metal expand at different rates, causing the strip to take on a curve and trip the switch, it doesn’t seem such a good idea for our spoilers – as the last thing we want is any warping or distortion. 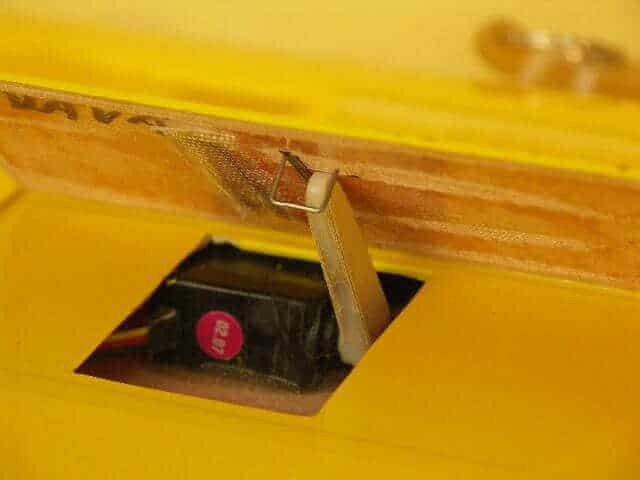 These days, then, I make ’em from laminations of balsa, this way you can recess one of the laminations for the flat hinges, thus overcoming the first problem of gluing the hinges in place without undue fuss. 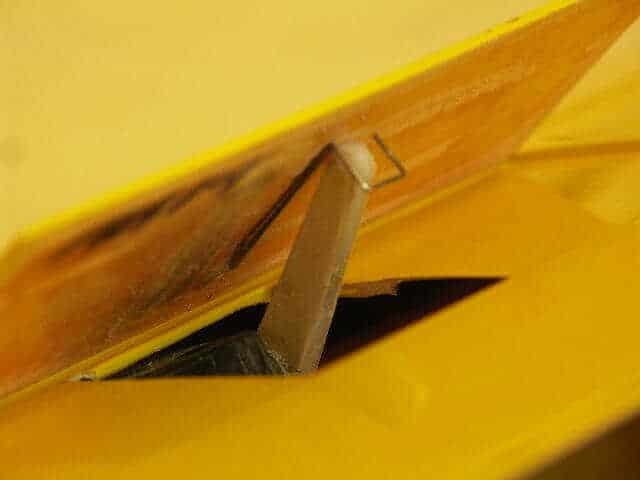 The hinges need to be as close to the upper surface of the spoiler as possible, as any material above will be liable to catch on the aperture, unless you set the gaps to be unacceptably large. It seems to be the best idea to leave the knuckle of the hinge proud of the LE of the spoiler blade, which will then leave you with a large gap. If you then fill this gap, by gluing in some hard-ish wood (it needs to be reasonably hard to stop the tex iron from denting it), with a little bit of fiddling about you can get a spoiler that opens to near enough 90 degrees – and yet still has reasonably close gaps. This, by the way, seems to work pretty well for ailerons too. If you support the rear of the spoiler with some scrap wood, you can then run a flat sanding block over the whole shooting match and get a nice snug fit. One more issue I’d like to delve into while we are at it, concerns the setting-up of the spoilers in the closed position in regards to the servo. Nobody likes to see their spoilers poking out proud of the wing, but what happens if we force the servo to pull the spoiler down against the wing! Oof goes your receiver battery, and down goes your predisaster flight time. So, if you therefore make the aperture in such a way that the spoiler can close down slightly beneath the surface of the wing, you will then have room to set-up the servo so that the spoiler is level with the wing in the closed position without unduly loading it. which is a good idea, seeing as your model spends most of its time with the spoilers firmly closed. If you think this is hard going (which it isn’t, really), console yourself with the thought that it’s much simpler than making up a set of Schempp-Hirth type brakes, but that’s another story. Basically what I did was to fabricate a longer servo arm. This was done by sandwiching a long Hitec arm plus a portion of another arm between two pieces of thin plywood. Sounds a bit goofy, but it has worked very well. This arm swings up and opens the airbrakes. Next, I wanted to be sure the airbrakes locked closed when not extended. I bent up a piece of music wire per the photo and glassed it to the airbrake. When the airbrake closes, the arm engages the loop in the wire and holds the airbrake closed. The wire is bent so there is some spring in it to allow the arm to tension the wire when closed.